Today marks the anniversary of Margaret Preston's birth on 29 April, 1875. Margaret was an Australian modernist artist. She worked in many different mediums in a career that spanned Europe as well as Australia, but is most famous for her beautiful paintings and wood block prints. Her art evolved in style over the years, but she always favoured still life as the subject matter of her paintings. I first came to know of Margaret's work through a joint exhibition of her work with that of Grace Cossington-Smith in Brisbane in the late 1990s. At that stage of my life, I thought it was the done thing for a young educated woman to visit the art gallery. The work of both Margaret and Grace delighted me, but I found Margaret's work particularly striking. I loved it so much that I bought a print of one of Margaret's still lifes and had it framed for my mother, and it still hangs in her kitchen. Margaret also championed various aspects of domestic arts, including interior decorating and cooking. I was delighted to find a book called Margaret Preston - Recipes for Food and Art late last year, which I have been slowly reading before bed over the last few months. That book, as suggested by the title, is a biography of Margaret Preston that not only discusses her life and art, but also contains numerous recipes from Margaret's own recipe books. To mark the anniversary of Margaret's birth, I decided to make a recipe from one of Margaret's recipe books. I wanted to make something that I had all the ingredients to hand (as winter is nearing and it was cold and dark by the time I started cooking), and which was practical in that I could eat it all without needing to have someone share it with me. I decided on Margaret's recipe for Egg Tomatoes. The title of the recipe might not sound inspirational, but the end result surprised me at how tasty it was. I had indulged in some rich food with friends earlier in the day, so an Egg Tomato was just the nutritious, light supper that I needed. Even better, you can make it easily for one, two or however many people you need to - you just have to have one egg and one tomato each. Cut the top off the tomato, and scoop out the flesh. Pour out the excess moisture, and sprinkle with salt. Place the teaspoon of breadcrumbs in the base of the tomato, then crack the egg on top. Season with salt and pepper, place on an oven tray, then bake in the pre-heated oven until the egg is set (mine took around 40 minutes). Eat and enjoy! Growing up, I wanted to be Vicky Dean from A Country Practice. I didn't mind that she was a grown woman who regularly sported pigtails and whose wardrobe largely comprised khaki overalls and wellies. 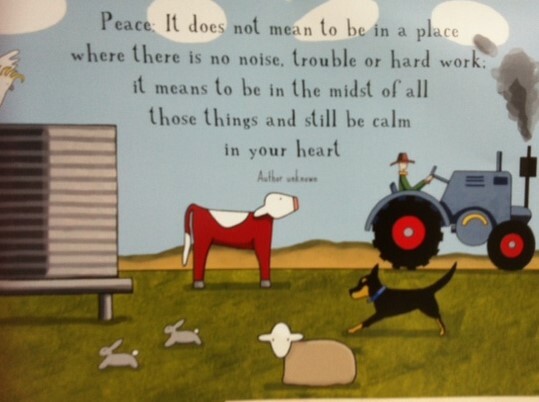 She was a vet, which meant she was smart and loved animals; she lived in the country; and she drove a hulking four wheel drive. I decided that was the life for me! When Vicky married Dr Simon Bowen, they played Wish Me Luck As You Wave Me Goodbye at their wedding reception as the going away song. It made a huge impression on me, as I have remembered it all these years later. With the advent of the Internet, it is easy to find out what was the song and the lyrics. I just had to wait over a decade to do so. Grease and flour an 8" cake tin, and pre-heat your oven to 190C. Sift the flour and baking powder with the ginger into a mixing bowl. Rub in the margarine with your finger tips, mix in the sugar and then the milk. Blend the bicarbonate of soda and the vinegar together, then beat into the cake mixture. Spoon the cake batter into the tin (I pressed it in as it is like a dough!) and bake in the oven for 20 minutes or until cooked through. Unfortunately, when baked, this cake had the look and texture of a large ginger scone, so I decided to make some icing for it. In trying to stay authentic, I used this recipe involving golden syrup, margarine and cocoa powder. The icing tasted a little odd, but on the ginger cake, it just gave it a bit of oomph of flavour. It's just a little unfortunate that it looks like Vegemite. This was a fun experiment in wartime cookery, but not one I'll be repeating. I will be starting a new chapter myself next week - wish me luck! This week's Eating with Ellie theme is Mash Ups, chosen by me. My pick for this theme is Ellie's Good For You Shepherd's Pie. At first glance, it looks similar to any other Shepherd's Pie. However, the "mash up" topping is not just potato - it is potato and cauliflower. And the potatoes have their skins left on! Also, there are heaps of veggies in the mince part of the pie - normally, a Shepherd's Pie has no veggies in the mince part. I think that next time, I'd add a spoon of promite or similar to spice up the mince a bit, but otherwise, I really enjoyed this version of Shepherd's Pie, which is very satisfying. To see what Mash Up madness everyone else got up to this week, visit the LYL section of EwE website. Today is ANZAC Day in Australia and New Zealand. It is a holiday to remember Australians and New Zealanders who served their country in all wars. The day is the anniversary of the landing of Australian and New Zealand soldiers at Gallipoli, Turkey in World War I. Our primary school always did a great job of teaching us about ANZAC Day and its significance. ANZAC Day ribbons were sold in the classrooms every year to raise money for war veterans, and the choir learned various ballads about those who served in the wars, including the verse above. We had a special school assembly at which the choir sang the aforesaid songs, and a member of the band played the last post on their trumpet while the assembly remained silent. In high school, much less was said about ANZAC Day. However, we watched the film, Gallipoli, as part of our English studies. It is the ending of that film that always gets me. To commemorate ANZAC Day in my own way while I am coccooned at home, I made the April recipe from my Red Tractor calendar, being Apple Crumble with ANZAC Biscuit Topping. Combine the sugar, oats and coconut in a small bowl. In a small saucepan over medium heat, melt the butter, golden syrup, water and bicarbonate of soda together. Pour over the dry ingredients, then chill in the fridge while making the apple filling. Preheat your oven to 180 degrees Celsius, and lightly grease 2 ramekins. Put all of the filling ingredients into a saucepan and cook over medium heat until the fruit is tender. Divide the apples evenly between the two ramekins. Remove the ANZAC biscuit mixture from the fridge and crumble into smallish pieces. Sprinkle the biscuit pieces evenly over the top of each ramekin, then bake in the preheated oven until the top is crisp and golden (~20 minutes). Serve warm with icecream and custard, if desired. This week's Tuesday with Dorie recipe is Lemon Meringue Tart A New Way. Lemon Meringue Pie is a perennial favourite, and when I brought this one to work, it was no exception. Someone was disappointed that they missed out because they were trying to be good, then they changed their mind and there was no pie left. Lemon Meringue Pies can be hit and miss. Too much meringue, it can be too sweet. Filling too lemony - it is not balanced out by the sweetness of the meringue (reminds me of the infamous "Sunlight Soap" lemon pie served to us at college, to much derision). 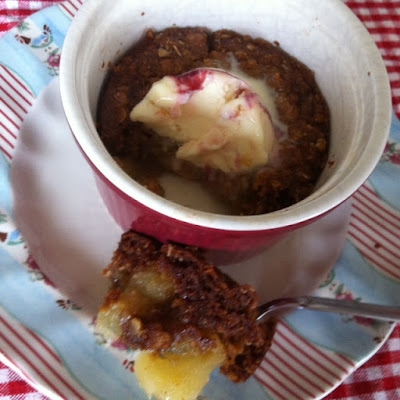 Oh, and some recipes have a weepy filling - check out the Daring Bakers version that I made many moons ago. However, this lemon meringue "tart" suffered from none of those shortcomings. The "new way", according to Dorie, is that this lemon tart has a flan-like filling. I believe that Dorie's introduction comes from the perspective that this tart is different to a traditional tarte au citron, which has a curd-like filling. However, it is very much the type of lemon meringue pie that I am used to, and which is a staple of Australian cafes. And what a lovely lemon meringue tart it is. The filling is a lemony pastry cream rather than a curd, so there is no weepiness, and it is smooth and silky. It also set up like a dream. The meringue was good, although someone said she would have liked more. To solve this, you could just use the two additional egg whites that are left over from this recipe to make a more voluminous meringue. I have neither a blow torch nor a broiler, so I just put my tart into the oven for an extra ten minutes after adding the meringue topping. It may have made the crust a little too brown around the edges, but it didn't detract from the flavour. Verdict - a thumbs up. While browsing through The Toowoomba Chronicle this week, I spotted an irresistible recipe for Baby Pear and Ricotta Tart. The recipe comes from a new cookbook by Emiko Davies called Acquacotta, which focusses on Italian family recipes. How cool does this tart look with the pears standing up and their stalks left on? It's a bit like stargazy pie, but without the gruesome factor. I changed the order of proceedings a little from the recipe by making the pastry first and letting it chill while I poached my pears so that I could seamlessly move from poaching pears to lining the pie tin with pastry then adding the filling. Would I make this again? Absolutely - it is striking to look at and so delicious. Betty's Burgers and Concrete Co is a burger restaurant chain founded in Noosa. It landed in Melbourne late last year, taking over a vacated Laura Ashley store location. When Betty's first opened, it was impossible to get in the door, such was its popularity, so I left my run at Betty's for a few months. Betty's is styled to mimic US-style burger joints, and is remarked by commentators to be like Shake Shack. I liked the kitschy 50's style store fitout, which I found quite charming. Betty's is still very popular, despite having been open for nearly 6 months now. At lunch and dinner, the lines still snake out the door as people line up for a seat. However, I am in the minority in that the décor is where my love of Betty's ends. Looks attractive enough, doesn't it. The taste was OK, but nothing out of the ordinary. And something about Betty just didn't agree with me. For a $15 burger meal, I was hoping for more. Ok, but not something I'll be hurrying back for. However, I am in the minority, judging from the ever snaking queues out the door and the rave reviews online. You can also buy frozen concretes at Betty's, which have some great sounding flavours, but at $8 a pop, I'll wait til I can share one. 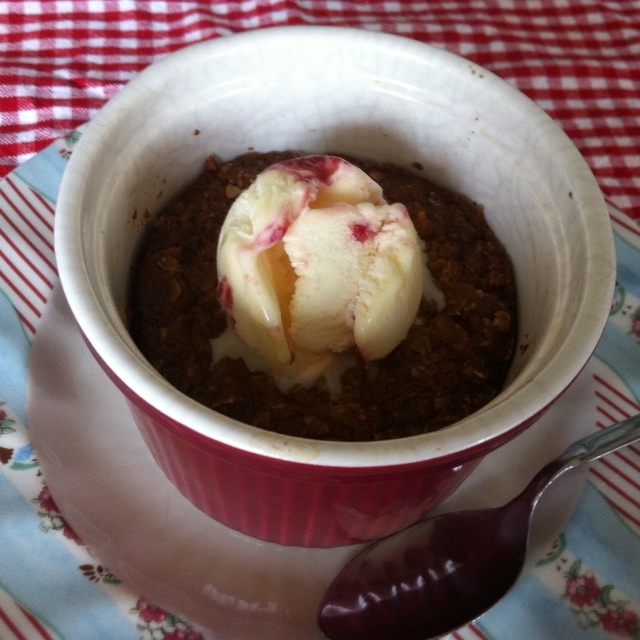 This week's Dorie's Cookies recipe comes from my own backyard - ANZAC Biscuits. Most Aussie kids grow up with ANZAC biscuits in the bikky tin, and I loved (and still love) my mum's version. I have made Anzacs myself a number of times over the years. The first time was a bit of a disaster, but things got better after that. The first Anzacs recorded on my blog were in 2008 using the same recipe as my mum (a la Margaret Fulton) in my South Yarra kitchen; since then, on my return to Melbourne, I made some healthy ones in 2012 (meh); and these in 2013 from my high school home ec cookbook. Dorie's ANZAC biscuits are a little more L M Downes than Margaret Fulton; much more oatmeal cookie-esque than the Margaret Fulton ones that I am used to. They are still tasty and smell good. However, mum's Anzacs win hands down. Dorie said that these biscuits would spread a lot, but mine didn't spread much at all. I also think that I would add back the 1/2 cup of sugar that Dorie took out; sweetened coconut is not common here, and as I used unsweetened coconut, I missed that extra sweetness that I associate with Anzacs. 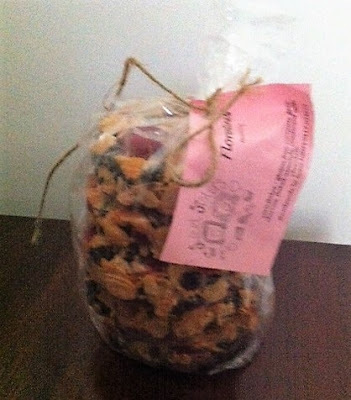 ANZAC Day is not until 25 April, but for Dorie, I am making these biscuits early this year. To see what cookies the others made this week and what they thought about it, visit the LYL section of the TWD website. As it was a public holiday, there wasn't much open in Bendigo. We decided to walk around Bendigo and take in the sights. I purchased a novel by Norman Lindsay at a second hand bookstore. I only previously knew him for The Magic Pudding, so it was fun to discover that he has also written adult fiction. It was sensational, and a great way to finish off our trip. Then it was onto the bus (yep, the trains were still not running) to return to Melbourne. As I mentioned earlier in the week, I have a colleague who has dietary restrictions for health reasons. To try and make sure that he didn't miss out on the fun, I researched some "better for you" Easter treats that I could make for colleagues. My second treat in this vein was Sugar Free Marshmallows, made from this recipe on Purely Twins. The process of making them is pretty much the same as for regular marshmallows, except that liquid artificial sweetener is used instead of sugar. Yes, this year all of my rabbits have green eyes, and I toasted the coconut that I rolled them in, which I like because it looks like fur. The sugar free ones are slightly different in texture, and they definitely are not as sweet as the regular marshmallows. They reminded me a little in flavour of the jet-puffed marshmallows that you buy in the US. I would be lying to say that I liked the sugar free marshmallows as much as the regular ones. However, if you are looking to cut down on sugar but like yourself some marshmallow, then this is a great recipe to use. I chose to make Ellie's Cherry Almond Chocolate Clusters from So Easy. And so easy they were. Pour melted chocolate over chopped roasted almonds and dried cherries, spoon into mounds and set in the fridge. Voila! These were delicious - you can't really go wrong. It's a bit like making mendiants - ridiculously simple but so good nonetheless. My Valentines Sonny Angel also happens to be a rabbit, so to get value for money, he is modelling my Cherry Almond Chocolate Clusters too. To see what everyone else made for Easter Eats this week, visit the LYL section of the EwE website. One of my colleagues is under dietary restrictions for health reasons, but I was still keen to make my annual Easter treats. I did some research, and found this recipe for "chocolate" Easter eggs on I Quit Sugar which cuts out the sugar in regular Easter eggs. The shell of the eggs is made from cacao powder, coconut oil, cacao butter and rice malt syrup. For my filling, I used a quarter of a cup of cashew nut butter with a teaspoon of COCO2 sugar free hazelnut spread. While these "chocolate" eggs do not taste exactly like real chocolate, they make a pretty good substitute, and the filling is pretty good too. It's a little like eating a peanut butter cup. I am not sure what the recipients thought of these, but I was pleased with them - they worked better for me than the actual chocolates I tried to make last year! This week's Tuesday with Dorie recipe is Laurent's Slow Roasted Pineapple. Initially, I was not enthused about making this dish. First, it's autumn here, and I had grave doubts about being able to find a fresh pineapple. However, my local fruit shop came through, and I bought a half pineapple instead of whole (because what was I going to do with a whole pineapple?). Second, I wondered why anyone would bother spending two hours roasting pineapple. Seriously, I thought, "why not just open a can of Golden Circle and be done with it?" However, after tasting this, I have changed my tune. The peeled and quartered pineapple is roasted for two hours with a mixture of jam (in my case, marmalade), booze (in my case, Scotch), and a mixture of spices (I used cardamom pods, black peppercorns, cloves and a cinnamon stick). Loved this - must bear it in mind as a summer dinner party dessert. To see what the others made this week and what they thought of it, visit the LYL section of the TWD website. 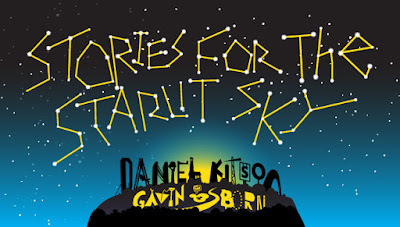 On Friday night, Tim and I went to see Daniel Kitson and Gavin Osborn in Stories For The Starlit Sky at The Playhouse as part of the Melbourne Comedy Festival. I was introduced to Daniel Kitson's work about 12 years ago by my then boss, who had seen him perform in London. I have previously been to two of Daniel's shows, both in Brisbane, and liked his whimsical brand of story telling. Stories For The Starlit Sky is a trilogy in three parts, which goes for three hours and 40 minutes. Daniel's story-telling is accompanied and intertwined with songs from Gavin. I was glad that I stayed for the whole show, because all three of the stories were part of a single whole told from three different angles. Quite a few people left either at the first or second break (we lost our neighbours on both sides), but you would have missed some crucial parts of the story/stories if you left before the end. To stay to the end was to be rewarded; I think that the last story was the most bitter-sweet of all, and it tied together a few loose ends from the earlier stories. This week sees Easter upon us, and I am looking forward to seeing my family over the break. In the lead-up, I spent a cold, wet miserable Sunday making some Easter treats for my friends and colleagues. First up, I made Apple and Cinnamon Hot Cross Buns. Lorraine from Not Quite Nigella made these last week, and pronounced them to be the "softest ever" hot cross buns. I was intrigued, because homemade bread is usually nothing like the fluffy store-bought versions. Lorraine's secret weapon is a mixture called a "tangzhong" to make the buns soft and fluffy. You can find the recipe here. I loved this bun recipe - it didn't have the slightly weird taste and texture of most homemade bread recipes, and the buns were beautifully soft and fluffy. 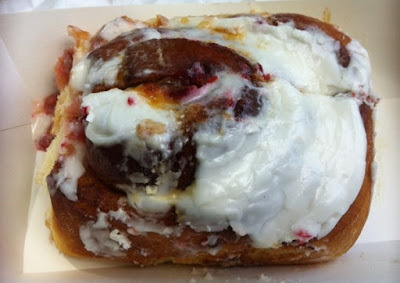 If you are keen to try your hand at hot cross bun making, I strongly recommend giving these buns a try. which was OK and did the important job of filling you up for the day ahead. We then hopped on a bus to Castlemaine (because the trains weren't running) and visited the beautiful goldrush era house, Buda. Both were tasty, but my favourite was the sachertorte (which surprised me as I usually go for fruity desserts!). We decided to order the 10 dish tasting banquet ($55), which was delicious, but do come hungry, as it is quite substantive. The courses are served on tiered plates, like a high tea. My favourite of this round was the salt and pepper squid. For me, the hands down winner was the zingy freshness of the duck larp, which was my favourite dish of the night. This time, the chips were the winner for me. I was so full that the richness of the pork was not what I wanted right at that point. There was no room for dessert, and we went for a walk through town to try and walk off some of our dinner. The service at Rocks on Rosalind was friendly and efficient, and the restaurant was conveniently located next door to our accommodation. I would happily go back to Rocks on Rosalind - but would order less food next time. This week's Eating with Ellie theme is Spring Harvest, chosen by Peggy. I can still imagine it's spring here, because the weather has for the most part remained warm, despite us being in the second month of autumn. To that end, I thought of fresh vegetables for this theme, and settled on Ellie's Penne with Zucchini and Mint. This pasta was a nice, meat-free meal to have for lunch or dinner. The zucchini gave it moisture and the mint gave it some zing. The use of wholemeal pasta provides fibre and lowers GI. This week's Dorie's Cookies recipe is Lemon Sugar Cookies. These are really simple mix, roll and bake cookies, but the are delicious. The lemon sugar cookies contain lemon juice and rind so that they definitely taste lemony. The hardest thing to manage with these cookies is that they spread a lot. Dorie says as much, as she means it. I ended up only being able to bake 5 cookies at a time on a tray. The first tray of cookies, with eight cookies on it, spread into one another. From a half batch, I only got 18 cookies - according to the recipe, it should have made 30. This was not a problem, as I don't want or need 30 cookies - just mentioning it as part of my experience in making these cookies. The resulting cookie is caramelised and chewy - I loved them. To see what everyone else made this week, visit the LYL section of the Tuesdays with Dorie website. For the recent Labour Day weekend, Tim and I packed our bags and headed for beautiful Bendigo, a 2 hour train ride from Melbourne. We arrived on Friday night for 3 full days. 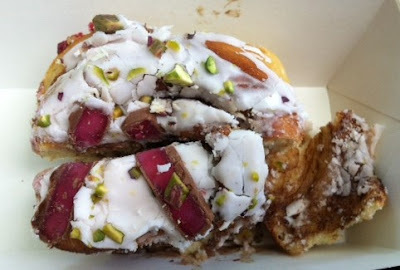 As with any trip, there was plenty of eating involved, and Bendigo has some culinary delights that are worth discovering. We had been a few times before, so this time, we sought out some new adventures. 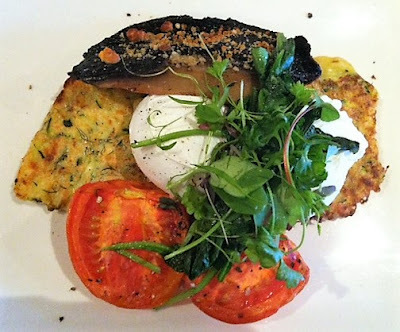 This was a tasty and filling breakfast which set me up well for the walking tour which we did that morning. It tasted pretty good, but I was underwhelmed by the girl who took my order at the counter, who could not answer any of the basic questions I asked about the other dishes I considered ordering (eg is there quinoa in this? How is it served?). For dinner that evening, we went to the GPO Bendigo, a modern Mediterranean restaurant which does a very fine range of tapas dishes delivered by efficient and friendly staff. We decided to go with the tapas so that we could try a range of dishes. The star of this dish was the delicious parmesan tuile. These soft shell tacos were delish. After dinner, we ended Day 1 of our Bendigo trip with a wander through the Bendigo Moonlight Markets in the mall, also held on the third Saturday of the month. These were bustling markets with more of a novelty feel than the Farmers Markets, although a few of the vendors were the same. It was extremely popular with young families, who took their children for some fast food and fun.